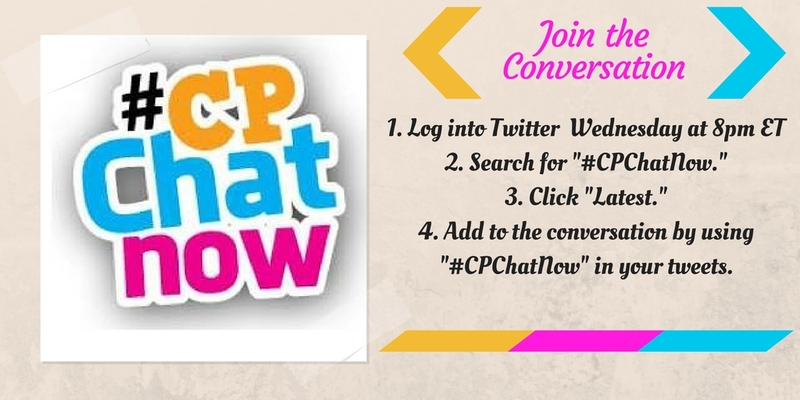 A New Year for the cerebral palsy Twitter chat #CPChatNow commenced Wednesday, January 3rd, 2018. 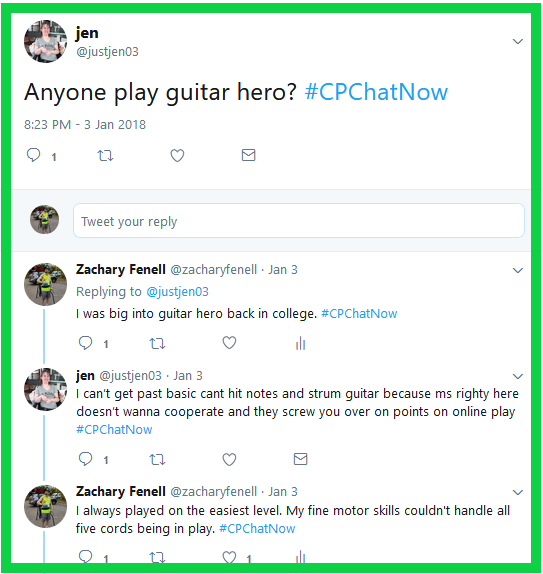 I am co-host Zachary Fenell, here to happily recap our first 2018 chat. Unfortunately my counterpart Devin missed the evening’s festivities due to feeling under the weather. However, I proved not the only co-host around to kick off the year. 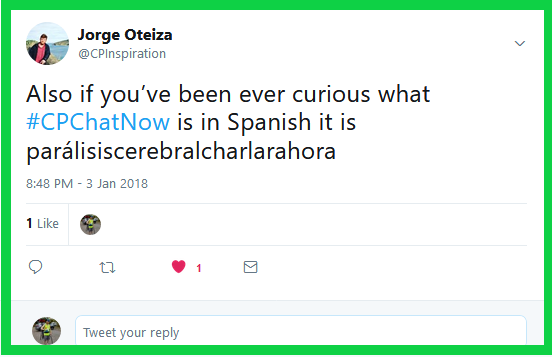 Over the past year a strong interest in Spanish culture emerged amidst #CPChatNow thanks to Jorge’s travels and participant Rachel becoming a trusted chat regular. Rachel knows Spanish culture from time she spent living in the country. She even enlightened us January 3rd, 2018 with a New Year Eve tradition practiced in Spain. Responding to my question about New Year Eve traditions, Rachel mentioned in Spain people eat 12 grapes for each stroke after midnight. She explained each grape represents a good month. I wondered if those who possess difficulty eating, can instead sip grape juice 12 times. Your turn now! 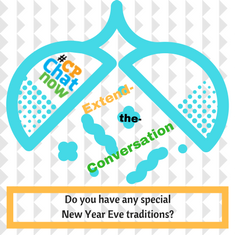 Answer as the week’s extend-the-conversation question, “Do you have any special New Year Eve traditions?” Traditions do not need to involve cultural heritage. Rather your tradition may merely entail a gathering with friends and/or family. 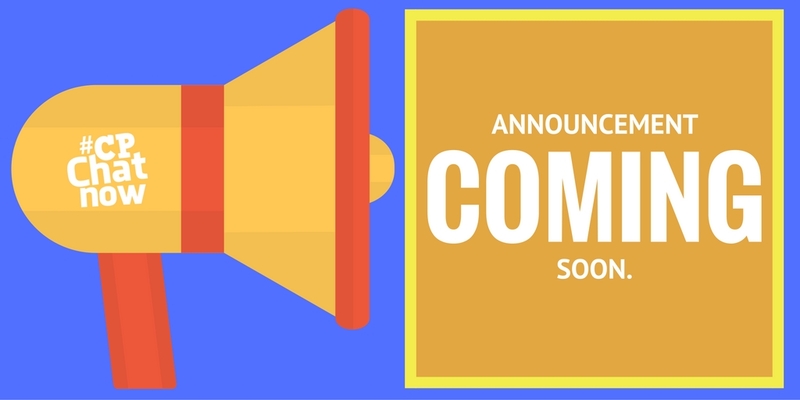 Let us know by leaving your New Year Eve tradition in the “Comments” section. Moving forth with the recap, throughout the night participants bonded over mutually shared CP related frustrations. For example, issues snow causes. After I mentioned noticing issues with the curb cut at my work, long-time regular Blemi revealed a far worse scenario. 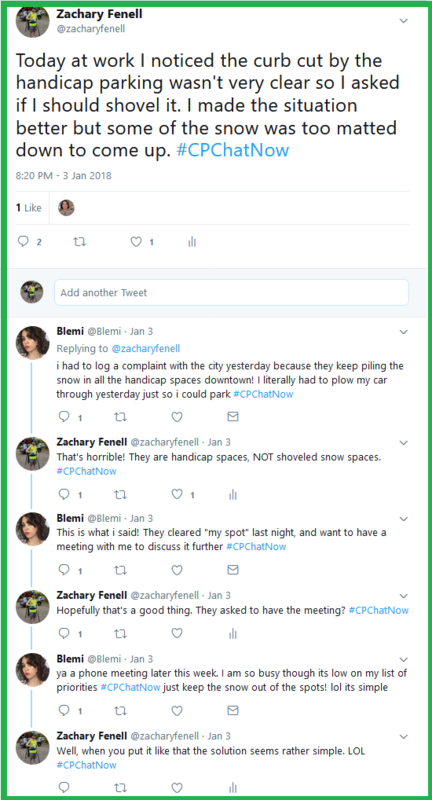 She noted city workers clearing snow only to dump the snow in handicap parking spots. Not cool! Additional frustrations discussed revolved around the video game Guitar Hero. Long-time regular Jen asked if anyone played Guitar Hero. I recalled playing the game in my college years. Admittedly, given my fine motor skills I found the game too challenging outside the easiest difficulty setting. An issue which also resonated with Jen! Whether video games, snowy obstacles, or something completely different, you will discover empathy from those who truly understand CP by participating in #CPChatNow. The Twitter chat occurs every Wednesday, starting at 8pm ET. Join us. Plus do not forget to answer the week’s extend-the-conversation question. Respond below via a comment.